Disney owns both Pixar and Marvel and so it may have only been a matter of time before Walt Disney Studios made a single movie combining the sensibility of the first with the action orientation of the second. That’s what they did here and at times I felt a bit whip-sawed as the humanity of the Pixar brand struggles – and fails — to rise above the chaotic effects of Marvel. I wanted more of the first; I’m a bit tired of the second. How many more super-hero movies do we need? Perhaps I was a bit disappointed because they had me at hello – which is where I met Hiro (Ryan Potter) and his brother’s creation, Baymax (Scott Adsit). Baymax is a gentle inflatable giant whose heart moves faster than his brain. He believes everyone is one hug short of where they need to be – and he’s eager to make up the difference. 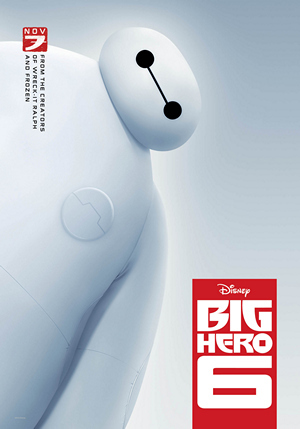 As Hiro and Baymax bond — before everyone needs to turn into a super hero – this movie has a lot of the Pixar magic that it struggles try to regain during the rest of the film when the Marvel mayhem runs rampant. There were times when I couldn’t decide if I was in “Big Hero 6” or some version of “Spiderman.” There is enough cross-generational humor in here so every member of the audience will be laughing, although at different times and different jokes. But – and I find this telling – there was very little applause at the end. I think the movie lost a lot of us along the way; I was entertained, but not charmed; for me, the movie promised more than it delivered.